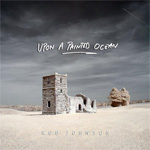 If UK guitarist and songwriter Rob Johnson sought to defy conventions or simply dispel preconceived expectations of his debut release, then he has certainly succeeded with Upon A Painted Ocean. This delightful work is exceptionally creative and expansive and should be enjoyed with repeated listens. Clever song titles (Monster Eats the Pilot, Maimed Titles, In Cahoots by example) are only the beginning of the eclectic and novel song composition to be enjoyed here. Most often Johnson is pressing the acoustic guitar to the foreground only to banish it with electric bravado (Maimed Titles or in cahoots) before resurrecting it again. Defining the nature of the song composition is like trying to grasp shadow puppets on the wall. Adjectives are bitter pills when describing this music. Johnson delights in an airy and lively atmosphere of some rock jazz fusion throughout, while at the same time riddling that atmosphere with curiosities from goofy morse code, nebulous spoken intros and plain noise (Milo's Revenge) to the traditional use of synthesizer or piano. Against this, a songs like Maimed Titles or 10:24 are simply exquisite in provocative innovation. Then again, a piece like Hello Magda moves on shear subtlety alone. Upon A Painted Ocean is a clever, knotty and wholly delightful aural soundtrack for your mind's more imaginative side. Defying conventions and comparisons, Rob Johnson is more than on to something good here. He's creating an ambitious and career defining moment for which few peers will be able to transcend. Highly recommended! Upon A Painted Ocean is a clever, knotty and wholly delightful aural soundtrack for your mind's more imaginative side. Defying conventions and comparisons, Rob Johnson is more than on to something good here. He's creating an ambitious and career defining moment for which few peers will be able to transcend.